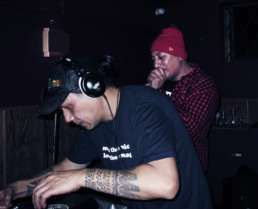 Antsman aka DJ Choice One was raised in Christchurch, lived in Auckland and London, and has had his home base in Wellington since 1999. When he was young, his parents gave him a portable three-in-one tuner/tape deck and record player that played 45s, which started his interest in needles on wax. Since then he has never stopped searching for the next treasure to discover, and he collects and plays mainly 45s in all kind of styles, especially spoken word and Viking Records. Antsman has a love for sweet melodies, big as bass-lines and stompin’ horns. 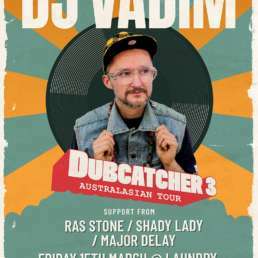 He collects and plays hip-hop, funk, soul, jazz, reggae, dub, jungle, breaks, drum and bass, dubstep, Pasifika and international vibes. He has worked with various artists and been part of many crews, including Legal Street Productions, Beats and Pieces, Pacific Underground, The Nomad, Rhombus, Audio Mechanics Radio Show and The Vehicle. 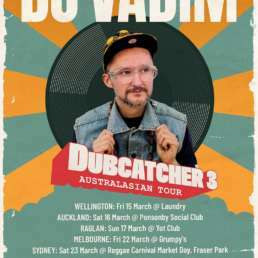 Highlights of his career include meeting Augustus Pablo and Burning Spear, seeing Jah Shaka live in London (1993), the Green Room freestyle sessions in Christchurch (1997), the first Hip Hop Summit, Christchurch (2000), The Gathering Festival in the mud (2000), Whatever Bar Rarotonga (2005), Japan trips (2007), Wasasa Festival Fiji (2008), WOMAdelaide/Womad (2010), meeting lots of good people and seeing lots of our beautiful country. Anstman sends big ups to myoume, range, Ras Stone, Sole, Matt the drummer, Michel Tuffery, Mike Busy, Dee, Si, Rosie, D.Kamali, Hamokane, transmit.co.nz and NiceUp crew. Shouts to Antsman for his Top Ten LPs for February 2013. The title track of this LP was one of the first Samoan songs I learnt called ‘Tele i`a O le Sami’ (there are many fish in the sea) originally composed by Napoleon A. Tuiteleleapaga, Ray Evans & Jay Livingston. The Samoan Surfriders comprise Rudy Spemann, Hugo Spemann, Eddy Eves and Horst Stunzner and are backed by Rudy and the Crystals. Suitable for romantic liaisons, adding to your collection, and playing at dinner parties. Digging in the crates this one is top shelf. It is a classic Maori waiata given the brass band make over, representing the marching and military band tradition in New Zealand. Featuring versions of ‘Hoki Hoki Tonu Mai’, ‘Po Ata Rau’ and ‘Mehe Manuhere’, along with Neil Stringer on Drums and Tangi Williams on Guitar. Suitable for Waitangi day, sampling, and no threatening for grandparents. These are my peeps from Christchurch; it brings tears to my eyes and makes me so proud. Named after the live show, musical director and producer Pos Mavaega has recorded music that combines the flavours of the warm tropics with soul and nostalgia in the superbly crafted original songs and traditional music of Samoa. Suitable for aiga (family) gatherings, Samoan Independence Day, and Government Pasifika fono. 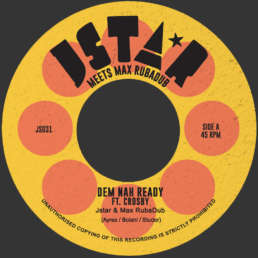 UK ragga jungle collective with many rotating members, mainly operated by Kemet Records label owner Mark X., has released both singles as well as compilation albums under this name. ‘The Seed’ and ‘The Box Re-opens’ were big tunes for me and this LP reminds me of the many jungle sessions had with DJ Kaboom (Kuru Apirana) in Christchurch 1995 – 1998. Suitable for big sound systems, sounds clashes, and making your knees wobble. I first heard this tune on a pirate radio station in London about 1993 and had luckily taped the show, so I had a copy. Some eleven years later I was in Toronto and stumbled across this LP with the tune ‘Hypocrite’. Bingo! I love it when that happens. Suitable for outdoor parties, Baobab café, and BBQs. With liner notes by David Rodigan, this compilation has quality written all over it and was one of the first ten LPs to kick off my wee collection back in ’86. It features the current hits of the day from UK, Jamaica and USA, but also captures the emerging digital reggae sound. Tops tunes include Smiley Culture, ‘Cockney Translation’, Jah Screechy, ‘Walk & Skank’, Frankie Paul, ‘Pass The Tu-sheng-Peng’ and the wicked version, Shinehead, ‘Billie Jean’/’Mama Used To Say’. Suitable for all social occasions. “You know what live and direct means…Live and direct means….live and direct”. Straightforward and to the point, this is live reggae at its best, featuring Brinsley Forde and the boys in their prime before commercial success, captured live at Notting Hill Gate Carnival. Features Rockers Medley, Love Fire and Drum and Bass Line. Suitable for playing to English geezers, radio shows, and late night sessions. Words from the prophet interviewed by Neville Willoughby, interwoven with live concert recordings. A reminder of the powerful force one human soul can be. Suitable for watching football, meditating, and educating yourself. Recorded at Channel One Studio with a classic line up with Sly and Robbie, Errol Smith, Aston Barret and Ansel Collins. ‘Dread are at the Controller’ is the tune for me, along with ‘Roots Lady’ and ‘Just Another Girl’ (later covered by UB40). Suitable for playing to plants, cooking, and eating chocolate brownies. The Horrified One Hyper D aka Mr Lick My Patu (Daniel Haimona), along with MC B.Ware (Bennett Pomana formerly Upper Hutt Posse) with tracks produced by Hame (Hamish Clark), Submariner and Zane Lowe, this a NZ hip-hop classic. ‘Behold My Cool Style’ is one of my favourite videos. Suitable for hip-hop parties, NZ music month, and showing to your grandchildren.